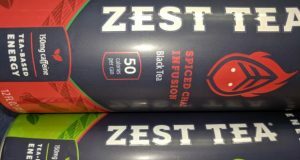 Following a $1 million investment round, Maryland beverage startup Zest Tea plans to expand to stores around the mid-Atlantic as it rolls out its line of canned iced tea energy drinks. Zest Tea’s canned iced teas are already in 7-Eleven locations around the region, but the startup hopes to expand that reach with the new funding. In order to gain placement in stores, companies often have to pay slotting fees and provide free cases to help a new product gain traction. Zest is also sending employees around to different locations to help merchandise, demo and promote their product, said James Fayal, CEO and founder of Zest Tea. These are all important steps for company trying to make a dent in a competitive space. “The (ready-to-drink) market is far more competitive and ‘dog eat dog’ than the bagged tea market, so it’s paramount that a company support new product launches with teams on the ground and promotional spend,” he wrote in an email. Part of that promotion includes working with a retailer’s headquarters to set up chain-wide promotions like 2-for-$4 or $1 off per can. “Both of these efforts are expensive, but they help drive early sales velocity, which is what keeps a product on the shelf and helps a brand build case studies to pitch to more chains and distributors,” Fayal wrote. But the chains also charge fees and require companies to provide free products, adding to the costs for a startup company looking to make headway in the market. For the stores, this is about reducing the risk of replacing an established product with something new, Fayal said. In addition to the mid-Atlantic push, Zest also plans to make a soft launch in the New York City area with some of the funding it received. Before it launched its ready-to-drink iced tea line, Zest was founded in 2014 as a bagged tea company. Its tea leaves are blended to provide more caffeine than regular tea. The company says its teas provide the same energy boost as coffee, but without the jitters and the crashes typically associated with highly-caffeinated products. Those bagged blends have already been available at stores including Harris Teeter, Safeway, Winco and HEB. The University System of Maryland’s Maryland Momentum Fund and the Lord Baltimore Capital Group led the $1 million investment round, along with participation from other angel investors.